Over the last three decades or so, dwindling interest among young Catalans has combined with pressure from animal-rights advocates and from Catalan nationalists to cripple toreo in Catalonia. Across the region’s four provinces, bullrings have closed; Barcelona’s is the only one still active. Here in Catalonia, this persistently separatist-minded region of Spain, bullfighting has been in trouble for ages. And the economy hasn’t helped. Ticket prices are akin to opera’s. Fights are expensive to produce. The number of bullfights plummeted across Spain this year. But José Tomás still draws enormous crowds. 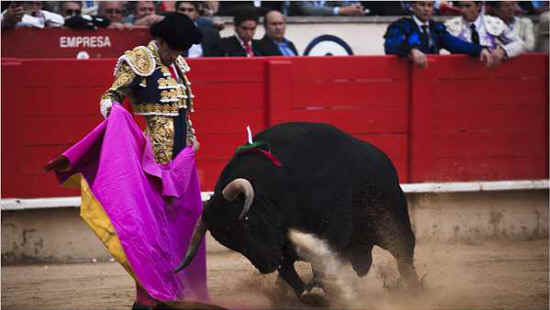 For aficionados, he is the last best hope for toreo, as bullfighting is called. Reclusive, a matador of unearthly fearlessness and calm, steeped in history and mystery, he retired in 2002, at 27 and the height of his fame, only to return unexpectedly five years later in Barcelona for what turned out to be the first sellout in 20 years at the 19,000-seat Plaza Monumental, this city’s beautiful old brick-and-tile bullring. Sunday he was back, for another special occasion: perhaps the last bullfight ever in Catalonia. Now a referendum before the Catalan Parliament would end bullfighting here altogether. There has long been talk in this part of Spain about a total prohibition on toreo. Fans have played it down. But this time, even aficionados think a ban is likely to pass. So Sunday’s corrida — the term refers to an afternoon’s regular card of three matadors and six bulls — was more than just the last bullfight of the season. It was possibly the end of an era. And José Tomás (José Tomás Román Martín, but everybody knows him by his double-barreled first name) had come, in what seemed almost like a last-ditch attempt, to lend his box office appeal and artistry to the anti-ban side. Artistry, that is, to aficionados. There is the art of the ritual, ancient and colorful, with its sequence of movements, firmly established but, because the bulls always vary, different each time and entailing a kind of balletic grace on the part of the matadors, who are judged not least by whether they can make the bulls look graceful, too. Bullfighting is a matter of Spanish cultural patrimony, fans say. Europe may wish to come together around common social and economic interests, but national cultures must be respected, and toreo represents cultural diversity. Opponents see it otherwise, of course. A dozen or so animal-rights protesters stood outside the arena Sunday, holding aloft handmade signs splattered with red paint. Up the street, at La Gran Peña, a bar favored by aficionados, Isabel Bardón, the bar’s owner, balanced a tray of beers while navigating a swarm of patrons, some craning their necks to see the retired matador, who was smiling for photographs beside older men smoking thick cigars. “It would be bad news for me and my business,” she speculated about the ban’s possible approval. It might be, who knows. What’s clear is that during the early years of the last century, Barcelona had no fewer than three bullrings. It was a mecca for aficionados. There were more corridas here from the 1920s to the 1960s than in any other Spanish city. But Catalan nationalists began to spread the notion that toreo was an imposition on Catalonia by Franco’s fascist regime, which promoted it, like flamenco, as a patriotic symbol. Opposition to bullfighting became a declaration of separatism by other means. Animal rights came along and fueled the nationalists’ agenda. That the issue remains, above all, political is demonstrated over the border, in the Catalan region of southern France, where bullfighting is embraced as fiercely as it is opposed in Spanish Catalonia, for exactly the same separatist reasons, in that case because it is banned in Paris. “At a point when Europe is becoming bigger and more multicultural, Barcelona is becoming smaller and more Catalan,” is how Robert Elms, a British travel writer who has lived here, saw the situation. He had come to see José Tomás and remarked, before the corrida, how the dark but magical city he once knew has become a shiny, designer-label hub that nonetheless looks increasingly inward. “It’s vanity,” he said “That’s the only word. Vanity describes an insecure culture.” The possible ban on bullfighting, he added, is akin to a law here requiring schoolchildren to receive much of their education in Catalan, not Spanish. Paco March nodded at the mention of that connection. A Barcelona native, he is the bullfighting columnist for La Vanguardia, the city’s second biggest newspaper. His 15-year-old daughter is called a fascist by her classmates, he said, because she has a picture of a torero pasted into her notebook. Aficionados talk this way. They point out how bullfighting makes death plain and visible at a time when most people, those who can do so, choose to put distance between themselves and the reality of it. Some of these same people condone factory farming by eating meat, but they condemn bullfights. Or they go to bullfights in places like Portugal, where the bulls are not killed by matadors. They’re killed afterward, offstage, so nobody has to watch. To matadors, that’s truly unfair, because it denies them their duty to the bulls, with whom they have fought, and spares them the particular vulnerability they are meant to experience at this point in the bullfight. Whether or not you buy this argument, it would be a mistake to conclude that an end to bullfighting here portends its prohibition across Spain. While nearly three quarters of Spaniards say they have no interest in bullfighting, they’re loath to have foreigners tell them what they can or can’t do. This is why Spain has consistently resisted pressure from the European Parliament and the European Court of Human Rights to end toreo. What will end it, if anything, is public indifference, competition from cheaper entertainment like soccer and video games, and the passing of a generation of aficionados. And so, in the failing light of a warm early autumn afternoon, amid the bursts of flashbulbs and chants of “Torero!” and “Olé!” José Tomás appeared at least one last time in Barcelona, the standard-bearer for an afflicted art. He orchestrated his usual series of hair-raising passes with the bulls. Like Roger Federer, he makes every action look impossibly slow and stylish. His costume sparkled under the spotlights. A brass band struck up a pasodoble. The fans cheered as if somehow his sheer eloquence might, at the last minute, save toreo from extinction here. They tossed flowers, hats, scarves, notebooks and just about anything else they had at hand onto the blood-soaked sand as he circled the ring.